It has been rainy, cold, and the sun is setting earlier and earlier (4:15 p.m.) and rising later and later (7:45 a.m.) and consequently our lack of outfit photos is becoming chronic. 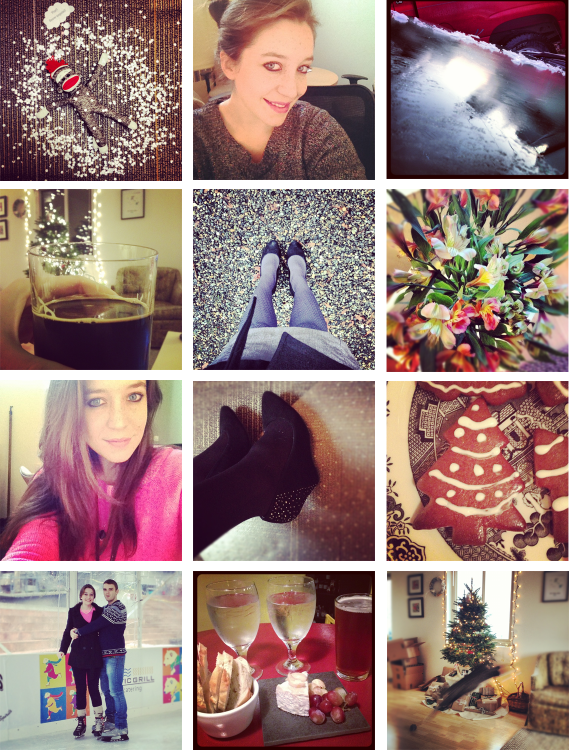 ): It's no substitute, but at least it's something: a winter instagram round-up for you! The past few weeks have been full of: 1) a sock monkey in the office pulling clever pranks; 2) sparkly sweaters and holidays buns; 3) icy car windshields but no snow; 4) deschutes brewery's abyss winter imperial stout; 5) tights in every color and pattern imaginable to make my summer skirts go farther; 6) bouquets of flowers from Ben; 7) neon for winter from Gap; 8) bejeweled suede wedges from BCBG; 9) gingerbread cookies decorated with care; 10) ice skating; 11) Pierre Robert cheese plate and IPA; 12) a Christmas tree and wild Christmas cat!